Quotes of the Week from The Librarians, The Walking Dead and More! Hooray! It's time to revel in more quotable moments in the world of television! Who knocked our socks off this week? Scroll through to find out! On the series premiere of Ash vs Evil Dead, we discover where Ash has been the past 30 years, and it ain't pretty. Has he grown up at all? Read on to find out! Ash vs Evil Dead begins its run tonight on Starz, picking up where Evil Dead left off, albeit 30 years later. Bruce Campbell gave reporters a preview. Ash vs Evil Dead: Renewed for Season 2 by Starz! Days before the debut of its Season 1 premiere, Ash vs Evil Dead has been renewed by Starz. Yes, it's that good! Ash vs Evil Dead: Watch the First 4 Minutes! You've waited 30 years to see Ash vs. Evil Dead again. But now the wait is over. Check out the show's opening four minutes now! Oh yeah! Ash vs Evil Dead is heading our way on Halloween and Starz released a behind the scenes look at the characters. Get to know them now! Eeeeaaaaaaaa! We are near! You're time comes again! Permalink: Eeeeaaaaaaaa! We are near! You're time comes again! I'm getting a little winded. Mind if we take a break and focus on me for a minute? Permalink: I'm getting a little winded. Mind if we take a break and focus on me for a minute? 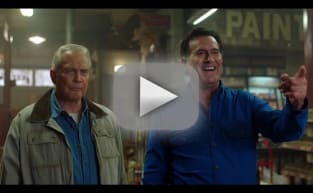 Ash vs Evil Dead Sneak Peek: Brock Screwed Ash Good! Ash vs. Evil Dead Season 2 Promo: More Gore, More Guts, More Groovy!! Ash vs Evil Dead: Watch First 4 Minutes Now. It's Totally Worth It!